CESENA, Italy — If you’re a lover of books and libraries like I am, you’ll get a rush stepping inside what is said to be the first public and monastic library in Europe, the Malatestiana Library. The experience is made even more remarkable when you learn that despite wars and natural disasters, the building, its furnishings, and manuscripts have all remained virtually untouched since the structure was built in the middle of the 15th century. On a recent road trip along the Via Emilia (the ancient Roman road that runs from Rimini to Piacenza), my husband and I had visited impressive fortresses, castles, and churches in a land that is rich with layers of history. When we stopped to tour the small town of Cesena, near the center of the province of Emilia Romagna, we chanced upon the Malatestiana Library, a gem at the foot of the verdant Appenine Mountains. The local tourist office provided a delightful English interpreter, Nicoletta Spinolo, who accompanied us on the short walk along cobbled streets to the Basilica of Domenico Malatesta Novello, which houses the library in a wing of the monastery between its two cloisters. Once there, a custodian welcomed us in Italian and used two large keys to unlock the imposing dark wooden doors. Carved in an ornate Gothic style, the doors have repeated rows of rosettes and helixes in a checkered design, celebrating the library’s benefactor, Malatesta Novello, a wealthy Cesena nobleman. At the top of the doors is the familiar elephant emblem of his family that we had seen in the duomo in Rimini. Entering the long, rectangular hall with terra-cotta floors, you feel as if you have stepped back in time. Some have called the library a church in miniature. It is divided into three naves. The wide center aisle is flanked by 20 impressive white, floor-to-ceiling columns, each bearing the Malatesta coat of arms at its top. On each side of the center nave are 29 rows of dark wooden “pluteuses’’ that look like pews but multitask as seats with inclined lecterns and bookshelves beneath. They, too, are embellished with Malatesta heraldry, painted in red, white, and green. Metal braces, placed there by ingenious engineers centuries ago, support the beautiful vaulted ceiling that has survived a series of earthquakes in the area. Used only during daylight hours, the light-filled hall is illuminated by arched windows on both sides and a circular window at the front. Chained to each of the desks are the large leather-bound books, the size of unabridged dictionaries, which were all hand-written before the invention of the printing press. The idea for the humanist library, which was built between 1447 and 1452, is attributed to the Friars of St. Francis, who wanted a study area annexed to their monastery. In what has been called the golden age of this city, Malatesta Novello agreed to finance the project. This entailed both building the structure and acquiring and commissioning the books. His team of “librarians’’ organized a two-decade-long effort to transcribe books they found elsewhere in Europe and return to Cesena with their contents. Six or seven Nordic writers were charged with copying the books into gothic or semi-gothic script; others were tasked to illustrate and bind them. The library holdings, totaling 343 manuscripts, include legal, medical, scientific, literary, theological, and philosophical works as well as 14 Greek codices and seven Hebrew ones. While it was open to the public, it was not a lending library. 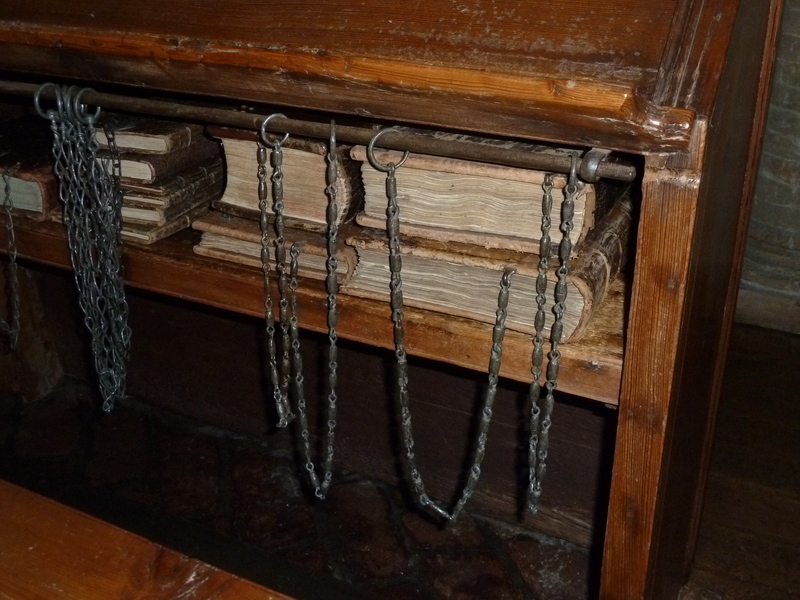 The books remain attached to the wooden desks by heavy wrought iron chains as they were then, subdivided by subject and kept in precise order. The people of Cesena always took great pride in their library as they still do today. In 1461, Malatesta, who turned out to be the last of the town’s noblemen, entrusted the Cesena community to maintain strict controls over the library jointly with the friars who were responsible for overseeing its use. This explains the dual key security system that was in place for so many years: One key was for the town officials and one for the monks. After Malatesta Novello’s death, the Town Council obtained permission to excommunicate anyone who attempted to remove one of the volumes. Today, the library’s holdings represent a treasure trove for scholars. Because of its unique place in history, in 2005, the library was recognized as the first UNESCO Memory of the World site in Italy.